I am a huge Blueberry smoothie fan. Seriously, I just can’t get enough of them! My original favorite recipe is in here, but when you drink the same smoothie 5 days a week, it can get a bit boring. Some variations do work (like the following cranberry smootie) and some don’t (like adding spinach to my blueberry smoothie). Although I am not a huge fan of cranberry juice alone, I figured it will add some nice flavor to my smoothie. And with reason. The combination of blueberry and cranberry was a huge success! I wish I figured it out years ago. But it is never too late. 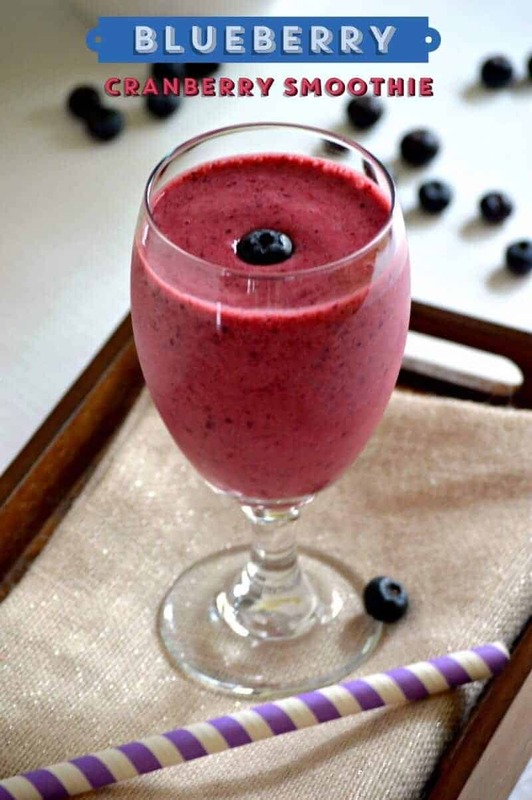 For this blueberry cranberry smoothie, I used fresh blueberries since they are available on the market. But you can replace with frozen ones too. I used an unsweetened version of cranberry juice. Let’s see how to make this blueberry smoothie with cranberry juice! Blend everything in your blender or Ninja until smooth. That’s it! If you want, you can add a little whipped cream to the top to make this more of a dessert smoothie! I leave it off because it’s just so good without. Did you know that July is blueberry month? If you’re looking for other delicious blueberry recipes, we have plenty to choose from! 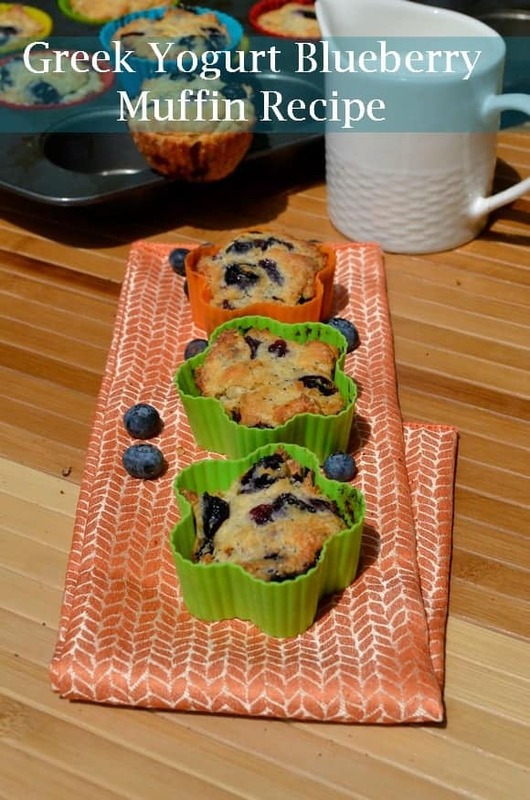 For starters, our Greek yogurt blueberry muffins would be perfect to go along with your blueberry smoothie for breakfast! If you’re not a Greek yogurt fan, try our lemon blueberry muffins instead. Prefer to skip muffins altogether for breakfast? How about a blueberry crepe recipe? Looking for delicious blueberry dessert recipes? 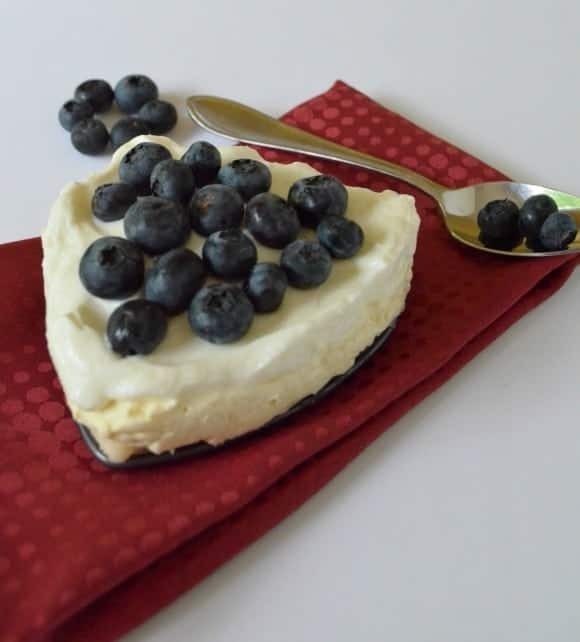 Our blueberry cheesecake is a huge hit at parties, but if you want something super easy to make with little prep time, try this easy yogurt blueberry pie. Blueberries are so diverse, you can use them in everything from yummy smoothies to amazing breads and desserts. I love them when they’re fresh in season, but you can also buy them and freeze them. What are your favorite ways to use blueberries when they’re in season? Tell us in the comments! I like the Cranberry Blueberry smoothie! Thanks! I was actually just told recently to start adding both cranberries and blueberries to my diet so this is perfect! Thanks for linking up with Delicious Dishes Recipe Party! Love a good smoothie! Thanks for sharing at Merry Monday! Yummy I can’t wait to make this smoothie. I have been looking for a recipe with cranberries in it. So Thanks. YUM, this smoothie sounds soooooooo good, I can’t wait to try it! We make smoothies all the time. This one looks great. Oh those look so good. I will have to try this. So many great ideas! My hubby loves blueberry’s… so we’ll have to try some of these! I am a blueberry addict so this is right up my alley! Yummy that smoothie is something I could go for right now! Thanks for sharing. Yum. Great recipes. I am definitely going to try the smoothie. Thanks for sharing! Oh that looks delicious! I need to break out my blender more and start experimenting with different fruit smoothies. Looks so good! My granddaughter loves blueberries not me :(will let her Mom know about them.! That sounds like an awesome smoothie. It sounds like a great way to start the day. What a great “blueberry delicious inspiration” on this post! The recipes are looking great (I bet they are also very tasty!) and being healthy is a big + of course! I am a big fan of blueberries and would love to try any of these recipes. I absolutely love blueberries. Thanks for these recipes. I can’t wait to try the smoothie and the Blueberry Cheesecake. This smoothie looks so good! Thank you for sharing the recipe with us. And the blueberry muffins are making drool! Save Big Bucks on Vacation with Kids Stay Free Deals!